Rev. Tommy French retired as pastor of Jefferson Baptist Church in 2009, but he shows no sign of slowing down or letting up. Most recently, he has been named chairman of the Board of Trustees of Louisiana College in Pineville, the state’s Baptist college and one of the premier colleges of education in the state. LC is close to Rev. French’s heart, and he will be spending even more time making it a success. Born in 1930 and ordained as a Southern Baptist minister in 1953, Rev. French has been a preacher for more than 60 years. He started Jefferson Baptist Church in 1958 as a mission of First Baptist Church. He pastored the church for 51 years. Rev. French previously served as Chairman of the Board of New Orleans Baptist Theological Seminary. He has held almost every office in the Louisiana Baptist Convention, including a two-year term as President. An international evangelist, he has preached all over the world. An experienced broadcaster, he had daily radio and television programs for many years. 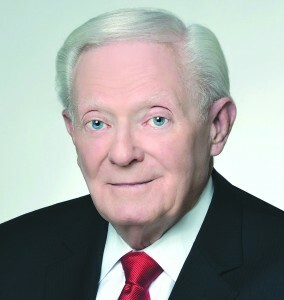 He served as Vice Chairman of the ACTS Television Network. His interests are varied, and he is also active in politics. He currently serves as Vice Chairman of the Louisiana Republican Party and a member of the East Baton Rouge Republican Parish Executive Committee. In business, Rev. French has owned a child care center for many years and Holy Land Bible Tours. He was married for 57 years to his wife, Mary Elizabeth Harrell, until she passed away in 2008. In 2010, he married Carolyn Sue Cook Peairs. He has two children, six grandchildren, and two great-grandchildren.